February and March probably are the coldest months in Georgia. It could go as low as 20s at night and as high as 70 degree Fahrenheit during the day. Flowers start blooming in the late February and early March, Daffodil and Camellia never waits for spring! They surprise you first thing in the morning without you knowing. This crazy weather also brings back my beloved hummingbird! Ruby-throated Hummingbirds start their journey migrating back from central and south America. 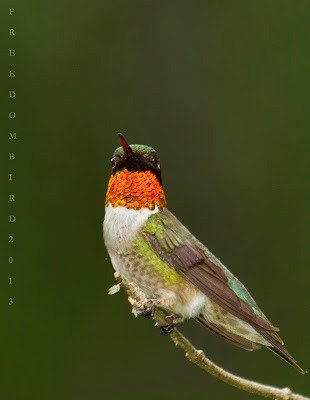 I have written many posts in the past about hummingbird, especially this Ruby-throated. This is the only species breed in the east of United States. Planting some of hummer's favor flowers (Click link to see a list of hummingbird flowers) definitely brings a warm welcome to these precious birds. If you have limited space, you can put up a nectar feeder. If you would like to put up more than one nectar feeders, make sure you put them far apart as hummingbirds are territorial, they will guard their own feeder and chase other hummers away. It's easy to make nectar, just one part of white table sugar (never honey) with 4 parts of water. I use filtered or boiled water as I find out nectar keeps longer this way. You can save extra nectar in fridge and it can last few weeks. You can also find nectar concentrate from bird supply store or Wal-Mart. But I will not recommend anyone buy those pre-mixed nectar because they do contain preservative, sodium benzoate, which is a carcinogen. If I don't eat food containing preservatives, why should I feed the bird I love the most with unhealthy food? During hot summer, please clean up nectar feeder with fresh nectar every two or three days as these home-made nectar spoils quickly under the heat.